So last year I entered a contest run by my favorite clothing store, Holy Clothing. Rather than “favorite” it is probably more accurate to say that they are the only clothing store I have any regard for whatsoever! This might be a surprise, but I actually hate shopping for clothes: I just find it tedious and frustrating, I don’t like hardly any of what I find in stores, I’d rather spend money on other things and I don’t care for fashion in the least. Since I found Holy Clothing, one of their skirts paired with a plain white shirt has pretty much been my uniform. They held a design contest late last year, promising to make the winner’s drawing into a real dress: I sent in three potential designs and one of them was chosen as one of four that were then voted on by the company’s Facebook fans. (I can’t find the link to the voting anymore, which is a shame, as all the sketches were very lovely.) I got $100 in store credit for winning, and the dress was supposed to be called the Liana Dress. 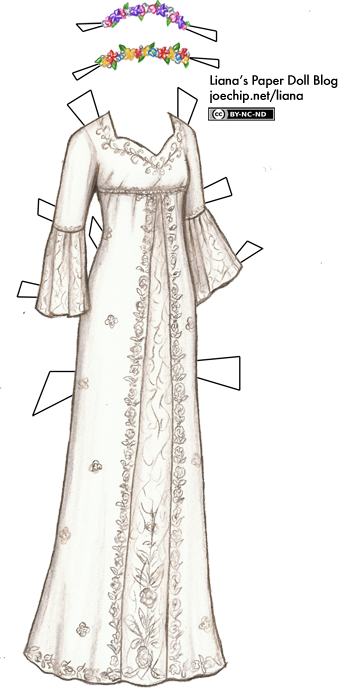 It took longer than they expected to translate the sketch into a dress, though, and then they wanted to release it in the right season, so it just went on sale this month. Well, in any case, if you want to wear something I designed, this may be as close as you’ll ever get! Check Holy Clothing out, as well as their very active Facebook fan page.